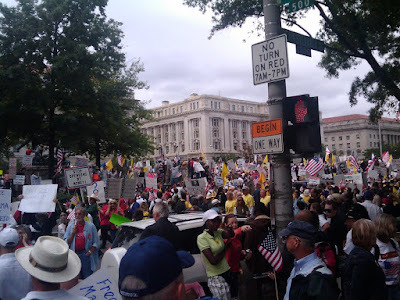 09.12.09 – Some are calling it the beginning of the Second American Revolution. Yet the hope is (for now at least) that this “revolution” will be fought with words rather than guns; on the battlefield of ideas rather than in bunkers all across the fruited plain. I think it was at that moment that my revelation occurred – this is no longer about Democrat vs. Republican; Left vs. Right; Liberal vs. Conservative; or Blue vs. Red. This is about We the People vs. Them. This is about liberty vs. tyranny. This is about a “sleeping giant” who has been poked and prodded one too many times by an overreaching, overly intrusive federal government and we…have…had…ENOUGH! Don’t Tread on Me! “We the People” are done with broken promises; we are done with bailouts; we are done with so-called “stimulus packages;” we are done with you making a career out of being a politician; we are done with you mortgaging our children’s future in order to buy votes to get re-elected; we are done with you creating one set of rules for us and a different set for you; we are done with you apologizing to the rest of the world for America being America; we are done with you calling us “uneducated,” “uninformed,” and “ignorant;” we are done with you not having to balance your checkbook the same way we have to balance ours; and most importantly, we are done with you pitting us against each other! At the end of the day, we are all Americans, and we are sick of your games. We refuse to play. We will start a new game with our rules. My revelation is that the revolution has begun. All of this talk of “hope” and “change” – I have finally come to realize that WE are the HOPE; and we ARE the CHANGE. We the People are the ones who will give “new birth to freedom.” No one in Washington can do it – not Barack Obama; not any Democrat; not any Republican; not the media – only us. You and me. With each day that passes, Democrats and Republicans are becoming more and more irrelevant. The “press” is becoming obsolete. They are being replaced by talk radio, internet bloggers, twitter and other social media outlets. They (a) think we’re too stupid to figure out on our own what’s really going on; and (b) are only concerned about their own financial security and advancement. Why do you think they spend so much time looking down their noses and demeaning all of these mediums? Why do you think they try to ignore hundreds of thousands of Americans converging on our nation’s capital to say “we have had enough”? “Why were you in Washington, daddy?” she said.